for , , and . First I would like to look at the graphs when p and k both equal 2. Equation a) is fuschia, equation b) is blue, equation c) is green and equation d) is black. 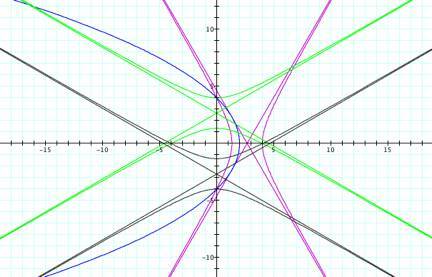 Each equation appears to comprise two straight lines, which intersect on one of the axes. 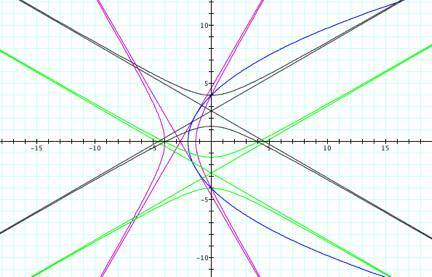 The two equations that contain cosine each intersect on the -axis with the one that contains on the left of the origin and the one that contains on the right of the origin. The two equations that contain sine each intersect on the y-axis with the one that contains below the origin and the one that contains above the origin. I believe that were I to zoom in on the above grid, then I would gain a better understanding of the relationship among the equations. These graphs appear to be very similar to the previous graphs, but that is only because I zoomed in more on this graph. Notice that the first equation is centered at an x-value of about -1.3, the second equation is centered at an x-value of about 1.3, the third equation is centered at a y-value of about -1.3 and the fourth equation is centered at a y-value of about 1.3. 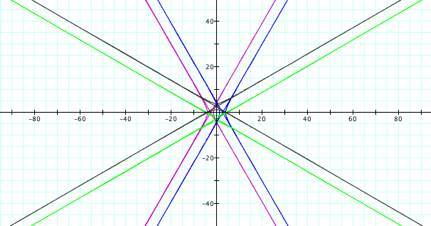 These graphs together are symmetrical over the y-axis and over the x-axis. The overall shape of these graphs is the same as the previous graphs. Now how does that compare to the graphs if and ? 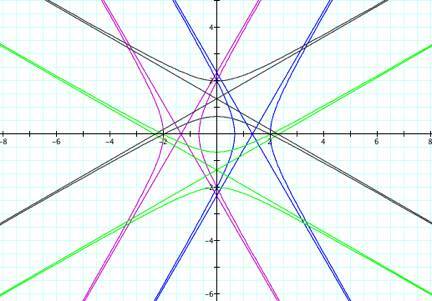 These graphs have a very different shape from the previous two grids. 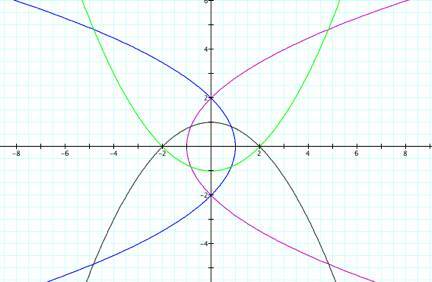 It comprises four parabola-like shapes. The first one opens right and has its left-most point at . The second one opens left and has its right-most point at . The third one opens up and has its minimum at . The fourth one opens down and has its minimum at . 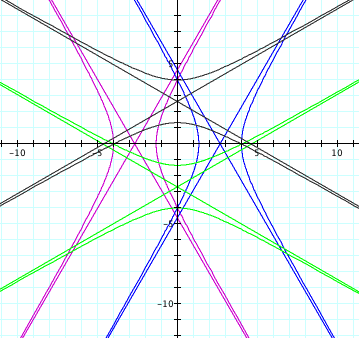 The graphs are still symmetrical over the y-axis and over the x-axis. These graphs are similar to the first two, but they are not symmetrical over the y-axis like the first two were. 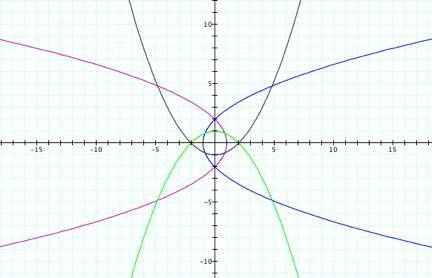 They are still symmetrical over the x-axis. These graphs are in exactly the same places as the ones on the third grid because I zoomed in more they appear different. The only difference between these graphs and the ones on the third grid is the placement of the individual graphs. On the third grid, the first equation was where the second one is now and vice versa. Also, on the third grid, the third equation was where the fourth one is now and vice versa. The graphs are still symmetrical. The difference between these graphs and the ones on the fourth grid is that these graphs mainly cover the second and third quadrants and on the fourth grid, they mainly covered the first and fourth quadrants. It appears like the graphs on the fourth grid were rotated about the origin 180 degrees to become the graphs on this grid.